The second Zumwalt-class guided missile destroyer has left a shipyard in Maine on Friday bound for California, Naval Sea Systems Command said in a statement. The 16,000-ton Michael Monsoor (DDG-1001) sailed down the Kennebec River to the Atlantic Ocean ahead of a commissioning at Coronado, Calif. on Jan. 26. The Navy accepted the first part of a split delivery of the destroyer on April 24. 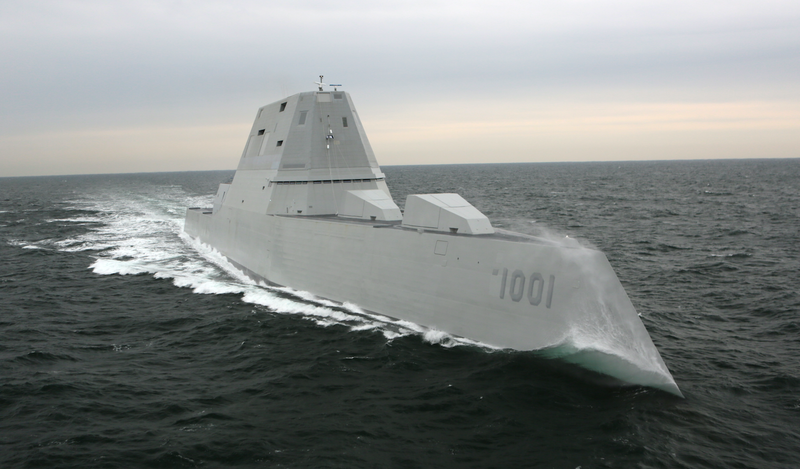 The destroyer suffered an engine casualty during the acceptance trials that required replacing one of the two Rolls Royce MT30 maritime gas turbines. “The problem we had coming off of acceptance trials was actually the turbine blades – so think of a jet engine on the side of an airplane, the blades that you see – we actually had some dings, some damage to those turbine blades,” the Program Executive Officer for Ships Rear Adm. William Galinis told USNI News in July. Once the ship is in San Diego it will be being the extensive combat system activation process that will test the ship’s sensors and weapons. USS Zumwalt (DDG-1000) has been moving through the process since it arrived in San Diego in 2016. In addition to Monsoor’s departure, Bath Iron Works began construction of the last Flight IIA Arleigh Burke-class guided-missile destroyer, the future USS Gallagher (DDG-127). The destroyer is named for Irish-born Marine Lance Cpl. Patrick Gallagher who earned the Navy Cross during the Vietnam War.